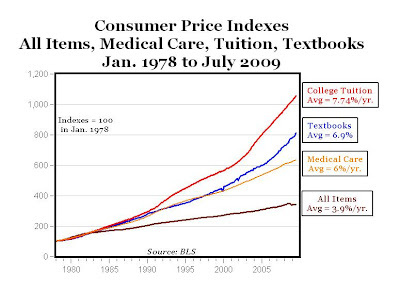 CARPE DIEM: Textbook Prices Have Risen Faster Than Medical Care Costs, This Could Be the Year of e-Textbooks? Textbook Prices Have Risen Faster Than Medical Care Costs, This Could Be the Year of e-Textbooks? College students frequently complain about the high cost of textbooks, and they have a point. As the top chart above shows, the cost of college textbooks (BLS category "educational books and supplies") has risen much higher than the overall CPI since 1978, almost 7% annually on average for textbooks versus less than 4% for all goods and services. Although not quite as high as the average annual inflation rate for college tuition (almost 8%), textbook prices have increased faster than even the cost of medical care (6%). The bottom chart above shows annual inflation rates for tuition and textbooks since 2000, and they have been increasing in a range of about 4-10% annually, compared to the overall average inflation rate of 2.67% over that period (not shown in chart). 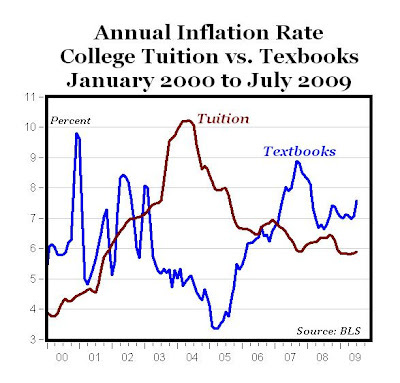 And since January 2007 the inflation rate for textbooks has exceeded the inflation rate for tuition for 30 consecutive months, confirming the general consensus among students (and faculty) that the affordability of textbooks has noticeably worsened over the last several years. And I suppose it's also the case that rising tuition is partly offset with financial aid, whereas rising textbook prices have to be absorbed more directly by students and their parents. For example, Greg Mankiw's "Principles of Economics" (5th edition) has a list price of $210.95 and an online price of $175.79 at Barnes and Noble. In other words, a college student today could spend more than $1,000 on textbooks (at the list price) per semester for 5 courses! And the list price of today's textbooks are almost as much as the cost of tuition for a 3-credit course at a community college ($254 at Mott Community College), although Mankiw's "Principles of Macroeconomics" sold separately (without the micro chapters) has a list price of "only" $158.95, and sells online for $133.50. For example, the eTextbook version of Mankiw's "Principles of Economics" is available at CourseSmart for $105.49 for a 180-day subscription (50% of the list price), and Principles of Macroeconomics is available for $79.49 (about 50% of the list price). There are two formats available: a) the online version which can be accessed from any computer with an Internet connection, or b) the downloadable version, which can be accessed from one computer only, without an Internet connection. In both cases, the subscription length is 180 days. This seems like a sensible alternative, especially for students who sell their textbooks back at the end of the semester and end up without the textbook in either case (buying a textbook and selling it back, or buying an eTextbook). And for those students who would like to build a library of textbooks, they can buy older editions of any textbook for almost nothing on the used market. For example, there are currently 432 used copies of the 3rd edition of Mankiw's "Principles of Microeconomics" available for sale on Amazon starting at $2, which is 50% less than the shipping cost of $3.99! Obama and Congress could pass the Making Textbooks Affordable Act which will provide an $8000 tax credit and low interest loans guaranteed by the government. Then they could establish Textie Mae to buy up the loans and securitize them. One of my interns asked to borrow Chiang which I bought in the 1990s (used) for $55. His soft cover, no color new copy would cost close to $200. Don't believe for one minute online materials will be any cheaper. They'll just be more profitable. I had one communist teacher assign 13 books for his class. The total bill was $200 for that one class and that was back in 1992. I got it! We should nationalize the textbook industry to make sure everyone has access to affordable textbooks! I got in trouble last year for not using the $300 worth of textbooks assigned for the class. I think the bookstore complained when the students returned their books early for a full refund. I wonder if students even feel those prices. Many have scholarships that pay for it and many more take loans out that pay for it. Because the textbook publishers know this, they're able to raise the costs just like medical suppliers are able to raise costs on Medicare probably. The biggest scam I remember was a new "edition" would come out making older editions possibly obsolete. Except you never knew what was different. So you couldn't buy one that was just a year or two old, and your re-sale value fell off a cliff. I recall my Calculus book was 5th or 6th edition, written by the Prof. He was in his 50's and I can't imagine there was that much change in Calculus over the twenty years or so since he had written the first edition. The chart of the inflation rates of various items is GREAT. It is charts like these that keep me reading this site. The observation that immediately comes to mind for the three items above the inflation line is that all three have something significant in common. All three are items that are largely paid for by a third party: Health care expenditures are largely paid by the government or insurance. Tuition and books are largely paid by government, scholarships or parents. Fox News did a one hour piece over the weekend on this issue and others related. My daughter just sent me the bill for an intro French textbook(college level) for $120. I've now got a real case of revenge against "big ed"--they make "big pharma" look like Mother Teresa. Hey, I think its time for "Comprehensive Textbook Reform"!!!! Thank G-d for Ebay, Amazon etc. This article fails to "complete" the math. If the text costs $210.95 (new) @ the University Bookstore it should cost $168.76 (used). When the student sells the book back to the bookstore the buyback price at most bookstores is half of the new price $105.47. The student paid a net of $63.29 to use the book for the semester. The consistent "fly in the ointment" is a professor that refuses to turn in a book order that insures that the text will be used again. Faculty need to stick with a text that can be re-used. What many people don't know and don't want known is that some faculty receive perks from publishers in return for using expensive and often non-returnable versions of textbooks. If you or your child enrolls in a class and the teachers name is on book being used...Run! It's a scam. Authors and publishers only make money when "new" books are sold.